What is SAP Sourcing CLM? SAP Sourcing CLM is a platform that authorizes and standardizes the processes of source-to-contract. It supports all popular systems of transaction and brings them together to guarantee compliance with contracts and visibility of processes. This solution is a product of SAP, known as a market leader in developing enterprise software. Being an SAP solution, it provides full solution regarding “source-to-contract” and provides builti-in integration with any backend systems already set up. It simplifies procurement and sourcing, facilitates compliance with negotiated terms, streamlines processes for greater efficiency, and increases the competitive advantage of its users. The SAP Sourcing CLM automates both the sourcing and the procurement contract processes, while it also improves governance related to such matters which ensures greater compliance along the way. Contract compliance is also improved by the integration with the backend systems. In the long run, these process improvements lead to greater sales and a larger number of satisfied users. Users have the option to host auctions to create a number of competitive scenarios, ensuring that all bases get to be covered and have increased chances of being able to make successful bids in the process. At the same time, the platform enables them to familiarize with the unique business requirements in certain areas. With the SAP Sourcing CLM solution, user adoption is accelerated with the help of powerful configuration features. Users get to choose the deployment option that meets their needs, whether be it the on-premise option or the one that is hosted with an SAP-certified partner. When it comes to creating contracts, these can set up easily with the help of using standard clauses and templates, which are then stored in a central repository. 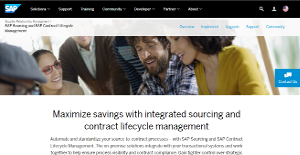 If you are interested in SAP Sourcing CLM it could also be beneficial to check out other subcategories of Best Contract Lifecycle Management Software listed in our base of SaaS software reviews. There are trendy and widely used applications in each software category. But are they necessarily the best fit for your enterprise’s specific wants? A market-leading software product may have thousands of customers, but does it offer what you need? For this reason, do not blindly spend on popular systems. Read at least a few SAP Sourcing CLM reviews and think about the elements that you wish to have in the software such as the cost, main functionality, available integrations etc. Then, choose a few systems that fit your wants. Try out the free trials of these platforms, read online opinions, get information from the seller, and do your research thoroughly. This profound research is sure to help you select the finest software application for your organization’s unique wants. How Much Does SAP Sourcing CLM Cost? SAP Sourcing CLM offers SAP’s traditionally flexible pricing scheme, where plans are tailored individually for each user in order to meet his most specific needs. Contact the company for enterprise pricing or more product details. We realize that when you make a decision to buy Contract Lifecycle Management Software it’s important not only to see how experts evaluate it in their reviews, but also to find out if the real people and companies that buy it are actually satisfied with the product. That’s why we’ve created our behavior-based Customer Satisfaction Algorithm™ that gathers customer reviews, comments and SAP Sourcing CLM reviews across a wide range of social media sites. The data is then presented in an easy to digest form showing how many people had positive and negative experience with SAP Sourcing CLM. With that information at hand you should be equipped to make an informed buying decision that you won’t regret. What are SAP Sourcing CLM pricing details? What integrations are available for SAP Sourcing CLM? If you need more information about SAP Sourcing CLM or you simply have a question let us know what you need and we’ll forward your request directly to the vendor.